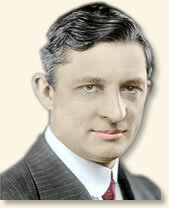 Air conditioning was born in 1902 when Willis Carrier, a mechanical engineer, developed and installed the first system in a publishing company in Brooklyn, New York. The Carrier Engineering Corporation was formed in 1915 to manufacture and sell his new technology. Carrier's invention would eventually have a revolutionary impact on America. The world without air conditioning was radically different from the one we experience today. For example, before air conditioning, the summer heat transformed Washington, DC into a virtual ghost town as politicians abandoned the nation's capital to escape its oppressive temperatures and humidity. The sizzling temperatures of cities such as Phoenix and Las Vegas inhibited their growth. The dripping heat of summers in the Deep South withered the enthusiasm of industries to locate there. Air conditioning changed all this. The extraordinary influence of Carrier's invention on American society is illustrated by its introduction into movie theaters in the 1920s. The film industry had a problem. Summertime's hot, sticky temperatures combined with the natural body heat of an audience crammed into a confined space to create an insufferable environment for movie-goers. As a result, the theaters saw the size of their audience, and consequently the size of their profits, slump during the summer months. Willis Carrier's invention offered a cool solution. In 1925, Carrier persuaded the Paramount Pictures Corporation to install his system in the Rivoli Theater - their flagship movie house under construction on Times Square in New York City. 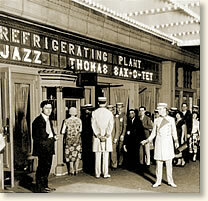 The system was ready for its test with an actual audience by the theater's opening on Memorial Day. The experiment was an outstanding success. People flocked to the Rivoli � as many to enjoy the cool relief from the heat as to see the movie. Over the next five years, Carrier installed his climate control technology in 300 movie theaters across the country. Air conditioning transformed the summer months from a financial write-off for the movie industry to its most profitable season of the year. "Yes, the people are going to like it." ". . . Typical of show business, the opening of the Rivoli was widely advertised and its air conditioning system heralded along Broadway. Long before the doors opened, people lined up at the box office - curious about 'cool comfort' as offered by the managers. It was like a World Series crowd waiting for bleacher seats. They were not only curious, but skeptical-all of the women and some of the men had fans-a standard accessory of that day. . . . Among the spectators was Adolph Zukor. I recall how quiet and reserved he was when he walked in and took a seat in the balcony. Zukor may have come from California, but he was there to be shown! Final adjustments delayed us in starting up the machine, so that the doors opened before the air conditioning system was turned on. The people poured in, filled all the seats, and stood seven deep in the back of the theater. We had more than we had bargained for and were plenty worried. From the wings we watched in dismay as two thousand fans fluttered. We felt that Mr. Zukor was watching the people instead of the picture-and sawall those waving fans! It takes time to pull down the temperature in a quickly filled theater on a hot day, and a still longer time for a packed house. Gradually, almost imperceptibly, the fans dropped into laps as the effects of the air conditioning system became evident. Only a few chronic fanners persisted, but soon they, too, ceased fanning. We had stopped them 'cold' and breathed a great sigh of relief. We then went into the lobby and waited for Mr. Zukor to come downstairs. When he saw us, he did not wait for us to ask his opinion. He said tersely, 'Yes, the people are going to like it.'" This eyewitness account appears in: Ingels, Margaret, Willis Carrier: Father of Air Conditioning (1952); Ackerman, Marsha E., Cool Comfort: America's romance with air-conditioning (2002). "Air Conditioning Goes to the Movies, 1925" EyeWitness to History, www.eyewitnesstohistory.com (2007). Margaret Ingels, the author of the book from which this account is taken, was the first woman in America to earn a degree in mechanical engineering (and the 2nd woman to earn an engineering degree of any kind). She graduated from the University of Kentucky in 1916. She joined the Carrier Engineering Company the following year and became a life-long evangelist for air conditioning. She became a good friend of Willis Carrier and later wrote his biography.